“Our cheese was white as the sky”, reminisces Ramie in The Trip, very different from the yellow cheese in Germany. He also misses the blue sky and Syrian coffee with cardamom, but above all his friends who didn’t make it out. “I tried to die, but no one dies here. They all grow old, get white beards and wobbly knees”, he says at the end of the play. Ramie is the alter ego of the author Anis Hamdoun, who in 2013 fled the Syrian city of Homs, the “city of the sun”, and arrived in Osnabrück, the “city of peace”, where he sought an internship at the theatre and was soon given the opportunity to develop his own play together with Osnabrück actors for the Spieltriebe Festival. The Trip comes to the point about how it feels to flee from hell and get stranded in a middle-class German medium-sized town. It is a melancholy homage to the dead friends of the Syrian war and the perplexity of the survivors. And it is a rare exception. For although the subject of refugees is currently ubiquitous in the German theatre, and refugees themselves often stand on stage or have their tragic fates told by actors, refugees are hardly ever the authors or directors of their own stories. 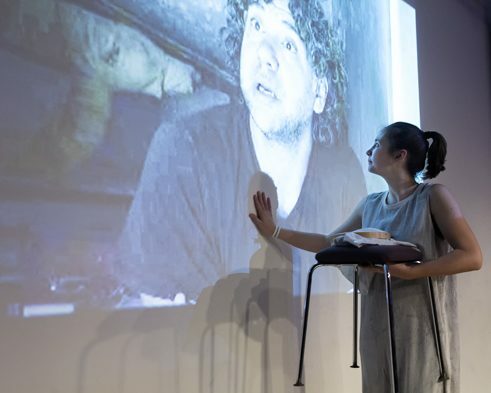 This makes every refugee story on stage ambivalent and brings it under the suspicion of being exhibited voyeuristically for marketing purposes – a kind of hour of compassion and penance mounted by Western directors for Western spectators, who afterwards continue with business as usual. 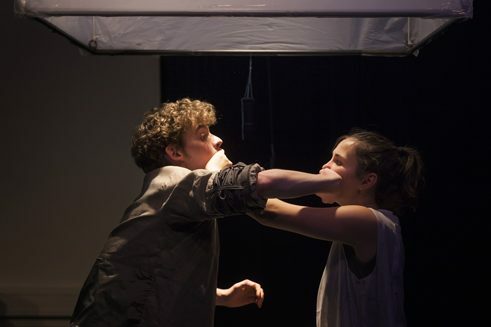 At the theatre festival “Impulse” in June 2016, for example, the sociologist and immigration researcher Tsiano Vassilis spoke of “refugee cannibalism”. Initially, The Trip was planned only as a one-off. But since then the play has been taken up into the Osnabrück repertoire, is constantly sold out, has been performed in Karlsruhe, Frankfurt and Munich, won the award of the 2016 nachtkritik Theatre Meeting and has been shown at the Berlin Schaubühne. Today Anis Hamdoun is a sought-after artist in Germany, speaks nearly perfect German and is shooting his own big, crowd-funding financed documentary film about “new arrivals”. A success story, which cannot, however, hide the fact that for Syrian artists in Germany there are hardly any job opportunities. “We need specific production opportunities for Syrian theatre in Germany – on the basis of respect, not as a charity event. And of course judged on quality, without a compassion bonus”, said the Syrian dramatist Mohammed Al Attar in Mach 2016 in the periodical Theater der Zeit. Al Attar, born in Damascus in 1980, is one of the most important Syrian playwrights and has since 2011 been an acute analyst of the Syrian conflict. His Antigone in Shatila, a transference of Sophocles’ classical drama to a Lebanese refugee camp with Syrian refugee women, caused a sensation. Today Al Attar, thanks to the support of the Heinrich-Böll Foundation, which offers help to refugee writers, lives in Berlin. Like many of his Syrian theatre colleagues who live in Germany today, he doesn’t really know what happens next, even though he seeks to network. His latest play, Während ich wartete (i.e. While I Was Waiting), has just been shown for the first time in Germany in a guest performance at the Theaterformen Festival in Brunswick. It was staged by Omar Abusaada, who was the director of Antigone in Shatila and is one of the few Syrian artists who continues to live in Damascus. There is still a kind of cultural life in the city; its renowned theatre academy still trains ten to fifteen graduates annually. Even if Al Attar is continually invited to panel discussions and readings – for instance, at the Theater an der Ruhr in Mülheim – it would be desirable that an artist of his calibre be more generally recognized in Germany. To this end it would surely be helpful to have regular artists meetings for refugees, such as take place at the Maxim Gorki Theater in Berlin, the Theater Mülheim an der Ruhr and the Literature House in Cologne. 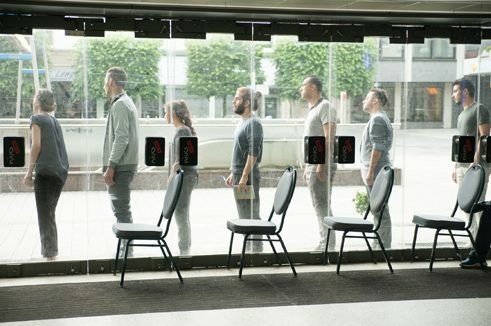 And this activity of self-empowerment could be developed further: “It is very important that Syrian theatre people remain connected and we share information about our work”, says Al Attar. “Als gestern jedes Heute noch das Morgen war und jedes Heute morgen schon zum Gestern wird” (i.e. (i.e. As yesterday every today was still tomorrow and every today will tomorrow already be yesterday), Ruhrorter at the Theater an der Ruhr. Refugee theatre people who raise their own artistic voices remain exceptions. Many of them may be found at the Facebook page “Syrian Artists in Germany”. For instance, Fady Jomar, poet and journalist from Damascus. He currently lives in a refugee camp in Marienheide, a one and a half hours drive from Cologne and is awaiting the recognition of his refugee status. 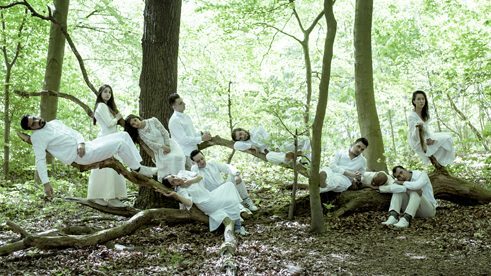 A strange contrast to the fact that, at the beginning of July 2016, his opera libretto for the opera Kalîla wa Dimna, based on a classic of Arabic literature, celebrated its premiere at the renowned opera festival at Aix-en-Provence – the first Arabic opera ever composed by a Palestinian, Moneim Adwan. Or the director Fadi Al-Sabbagh, who lives in Waiblingen and there staged his play Jasmin; or the thirty-year-old Ramadan Ali, who acts at the Jungen Theater in Augsburg and the Akademietheater in Ulm, and who there has also filmed a video clip about his experiences as a refugee. Should stories of flight and migration still be told on the German stage at all? Don’t refugees, who are not artists, have more important things to do? In Germany there are now some projects in which tales of woe are deliberately left out. For example, the Ruhrorter at the Theater an der Ruhr: in an abandoned Woolworth department store, eleven refugees between the ages of sixteen and thirty-eight have been rehearsing for months Als gestern jedes Heute noch das Morgen war und jedes Heute morgen schon zum Gestern wird (i.e. As yesterday every today was still tomorrow and every today will tomorrow already be yesterday); it tells a self-improvised, universal, poetic coming-of-age story of baffled times, which everyone must pass through in order someday to lay down roots. What preoccupies them, stranded in the waiting halls of offices, pursued by memories of war, full of hope, the audience can only guess: it is never said outright. Anis Hamdoun, who in addition to all his other activities gives theatre instruction to unaccompanied refugees at a technical college in Osnabrück, is nevertheless convinced that “theatre can help overcome traumas and anchor people in society. The tales of war must be told and heard. Only then can you again concentrate your mind on other things”. And he also believes that directing and controlling their own stories should be left to refugees themselves. Ruhrorter at the Theater an der Ruhr.